Perfume Society Blogger of the Month Giveaway! 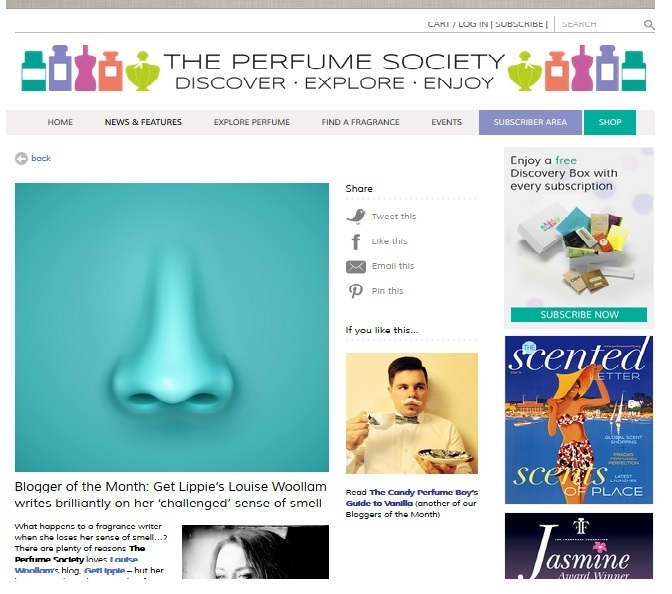 I can’t even begin to tell you how happy I am to have been chosen as The Perfume Society’s Blogger of the Month for August! As many of you might know, perfume-reviewing, something I genuinely love, has been incredibly challenging for me over the last 18 months. After having first lost my sense of smell completely, only to then have it come back distorted and having to live in a surreal poo-scented universe for the last year or so, life has been tough, and confusing. I am, however, recovering, and perfume reviews, though slightly thinner on the ground than they used to be, are now happening again, and that’s something else for me to be glad about. Over the last while I’ve had astonishing support from readers of the blog, the people who read my piece in the Guardian, and I still get emails almost every day from readers of my side-blog (The Parosmia Diaries), but the support I’ve had from The Perfume Society (alongside that from 4160 Tuesdays, but more, a lot more, about that very soon), is genuinely what really helped me turn my life around last year. I bumped into Jo Fairley, the founder of Perfume Society quite by accident on one of the darkest days, both literally and metaphorically, of my life and her unfailing support and generosity since then in allowing me space to write about – and in the so-doing, get some perspective on – my condition has been a godsend. And, in another lovely gesture of generosity to celebrate my inauguration as only their second-ever Blogger of the Month, they’re giving away 10 of their fab VIP Subscriptions (worth £25 each) to my lovely readers! Each subscription entitles you to eight copies of their fab digital magazine The Scented Letter, a “Discovery Box“, filled to brim with 8 fragrance samples, a scented handcream, a notebook and a set of perfume blotters, an invitation to a free “How to Improve Your Sense of Smell” workshop, and invitations to scented events galore, including exclusive evenings at perfume locations across the UK (I’ve attended a couple, they’re roaring fun!) and much more besides. The giveaway is open to anyone in the UK (I’m really sorry, worldwide readers – but shipping restrictions are a nightmare for perfume) and all you have to do to enter is to leave a comment on this post, including your email address, please, telling me what smell you would miss most if you lost your sense of smell (and why!) and I’ll pick ten winners at random on 23rd August. One entry per person only. Multiple comments will be deleted. There are no cash alternatives to the prize which is one VIP subscription to The Perfume Society for each of ten individual winners. Winners details will only be shared with The Perfume Society and no other third parties. The editors decision is final and no correspondence will be entered into. Entries not adhering the to the rules will be removed from the post and not entered into the draw. EDITORS NOTE: there are a large number of “illegal” entries, many of which have appeared here from a forum posting. These entries will be removed. PLEASE READ THE RULES, thank you!